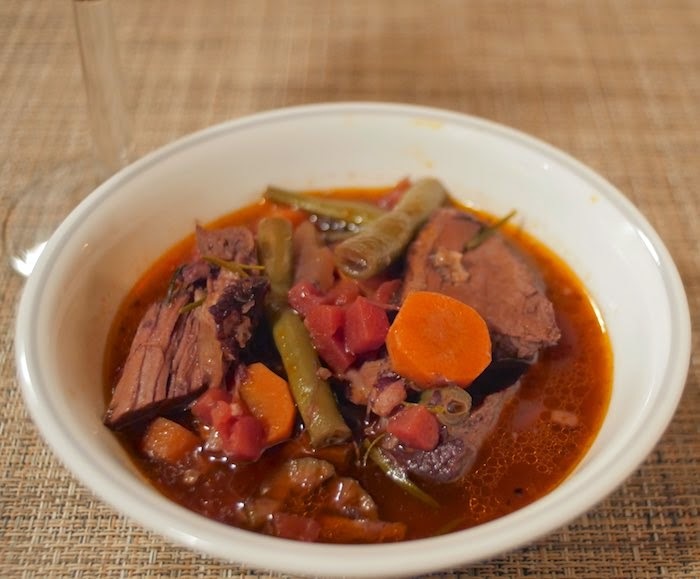 There's something about adding wine to slow cooking meals that is both comforting and sophisticated. Maybe it's the earthy aroma that over takes the house, I don't know, but whatever it is I find I am drawn to cooking with wine. The next time you are thinking stew I highly encourage you to try this Chianti Beef Stew; unless of course you are a vegetarian. The beef is cooked for hours in an Italian red wine making it extremely tender and the sauce much more flavorful. Although most stews include potatoes, I much prefer substituting them for a crusty piece of bread for swabbing up the juice. Place the meat in a plastic zip lock bag. Pour the wine over the meat and marinate in the refrigerator for 1 1/2 hours. Turn the meat over and marinate for another 1 1/2 hours. Remove the meat from the wine and pat dry with paper towels. Reserve the wine. In a large Dutch oven, heat 3 tablespoons of the oil over medium-high heat. Season the meat on all sides with salt and pepper. Using tongs, place the meat in the pan and brown on all sides, about 2 minutes each side. Remove the meat and add the remaining oil. Add the pancetta and cook, stirring frequently for 2 minutes. Add the carrots, celery, garlic, olives, green beans, rosemary, and sage. Cook for 3 minutes. Pour the reserved wine, tomatoes, and beef broth into the pan, scraping up the brown bits that cling to the bottom of the pan with a wooden spoon. Return the meat to the pan and bring the liquid to a boil. Cover the pan and simmer for 3 to 3 1/2 hours or until the meat is very tender. Remove the meat, sage and the rosemary sprigs from the stew. Place the meat on a cutting board and cut into quarters. Using 2 forks, shred the meat into bite-size pieces. Add the shredded meat to the stew and cook until warmed through, about 5 minutes. Serve immediately with Italian bread for dipping. Why have I not added wine to the crock pot??? I bet it's awesome! What a great looking dish! Total comfort food! I love how you packed so many good things in one dish, I bet the flavor is incredible! This beef stew looks fantastic! I've never used wine in any of my meals. I have to give this recipe a try! Comforting food at it's best! I'm sure it is super tender cooking in the red wine! I love cooking with wine, also. The smell can't be beat! Love cooking with wine and drinking it while cooking with wine. Great recipe! With a new skiff of snow on the ground after a big storm this weekend this looks yummy! Printing for my recipe box as I can't wait to try it. OMG I can see in the photos how tender that beef is! It looks so delicious and I'm with you on needing a good chunk of bread to go with. This sounds like a wonderful stew! Perfect for the cold snowy weather we're in the midst of here. Mmmm.... definitely not a vegetarian over here! That beef is calling my name! This stew looks really hearty and delicious. Looks like a delicious bowl of stew! I love the idea of skipping the potatoes and grabbing a delicious bread to sop up every last drop!